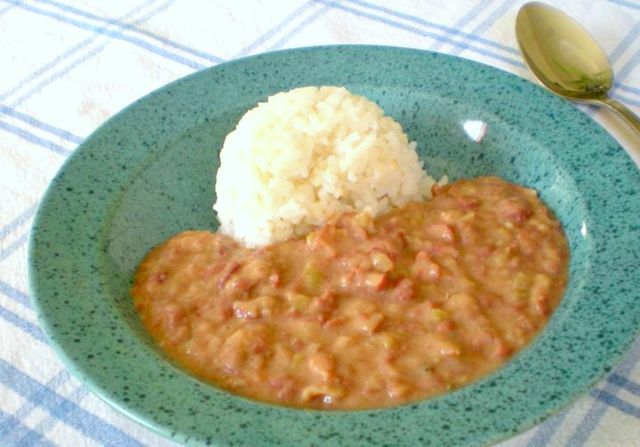 A Creole dish traditionally made on Mondays from Sunday-dinner leftovers of pork, smoked sausage, or ham, when the woman of the house was busy with laundry. Since I used bacon in my recipe, it’s not considered authentic, but it’s easier than dealing with a ham hock and still quite tasty. For a vegetarian version, omit the bacon, saute the veggies in your favorite oil, and add liquid smoke to taste. Entry filed under: Cajun & Creole, For One or Two, Main Course, Popular Ethnic Dishes, Sides & Salads. Tags: red beans.